Sr Lieske has had a really busy 2015. (Amongst other things, she got married in September). I would like to thank her for all the hard work she has done for the Breast Course for Nurses and take this opportunity to personally thank Brad for his support. Just before the end of the year, she compiled this summary of all the activities of the BCN. 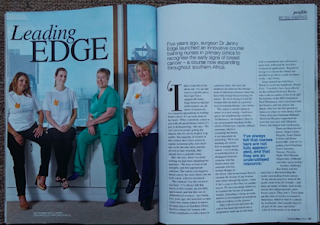 The Breast Course for Nurses has had another busy year and of course none of it would have been possible without your help! This is an update on all the activities that we have been involved with throughout the year! 3. Cape Town, South Africa: we completed this course in March. Fifteen nurses attended. The group was made up of mostly surgical nurses and volunteers. We were very fortunate to have Vaunda Parsonage present the lymphoedema session which the students all really enjoyed. A special thanks to Dr Miriam Mutebi and Dr Ronelle de Villiers for their assistance with the lecturing. Thank you to Sr Lieske Wegelin, Michelle Norris and Sr Sheila Correia for all their assistance and involvement with the course. 7. Johannesburg, South Africa: We have recently commenced a course in Johannesburg. This course is being run by Dr Sarah Nietz and Sr Sheila Correia with the assistance of Sr Tumeka Nojoko and Sr Colleen Davis. This is the first course that is being run without Dr Edge being present. We aim to have more courses like this as we would like to start with train-the-trainer courses in 2016. Just over 70 health care workers attended the course and we look forward to the follow up course early in 2016. Ø We visited the Well WomanClinic in Harare – they have facilities for cervical screening, breast screening and bone density scans. They combine clinical examination with a mammogram. 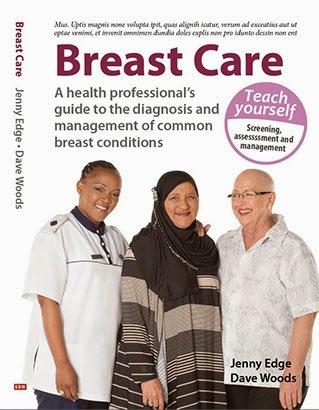 Ø Dr Edge presented a session at the Radiographers Course in Cape Town where she taught about the clinical aspect of the management of breast cancer. Bergman, Ross and Partners sponsored a Breast Care book for each student. A big thank you to them for that. Ø Jessica Knight and her sister Juliet Baxter (the Santa Sisters team) completed the Joberg2c mountain bike race. They cycled to support the Breast Course for Nurses. The Santa sisters started a blog before the race began to keep us up to date on their preparation and training and continued to blog and tweet throughout the race. Ø The Breast Course for Nurses featured in the May edition of the Fairlady Magazine. Thank you to Liesl Robertson for writing the article. Ø We had a successful fundraiser at the Atlantic Imbizo Conference facility. We had a delicious high tea followed by an auction and raffle prizes. We were entertained by Belinda Prinsloo. There were many sponsors for the day and many people that assisted to make the morning so special! A very big thank you to Michelle Norris and all others involved. Ø We were invited by medical students from UCT to assist them with a project to educate refugees about breast examination and breast cancer. Ø Darren Francis, a photographer from Cape Town, exhibited portrait photographs of women affected by breast cancer and women involved in the care of women with breast cancer at the Breaking Dawn photography exhibition at the Young Blood Art Gallery in Cape Town. He included the Breast Course for Nurses in his campaign to bring across the message that early detection and treatment saves lives. Ø We visited 2 of the hospitals in the north of Namibia. We travelled with Prof Celestine Mbangtang and were welcomed in the hospitals that we visited. It was a very interesting and eye opening day. Ø Dr Edge went to the AORTIC conference in Marrakech, Morocco. She was fortunate enough to be able to present a talk about the Breast Course for Nurses and to represent the course at this cancer conference. Many thanks to Well Woman Diagnostics for their sponsorship. In 2016 we will continue to run courses in South Africa and other countries in Southern Africa and Africa. We will be commencing with train-the-trainers courses so that future courses can be run without Dr Edge being present. Ø The Breast Course for Nurses is very proudly on Facebook and Twitter! These sites are continuously updated and should be used to stay up to date with us and with what the Breast Course for Nurses is busy with! Our website is updated every few months therefore it is more reliable to stay up to date with us via social media.